Value is a subjective thing. Spending obscene amounts of money on, say, a tourbillon watch may seem a waste of money to some, but to others, the fine, hand-crafted detail work and composition of exotic components make them worth every penny. The same is true with motorcycling. There are countless custom shops creating wildly expensive, one-of-a-kind two-wheeled specials. These shops largely focus on creating outrageous cruisers for people looking for the pinnacle of two-wheeled style at any cost. But there’s a small company in Bolton, England, that’s giving extra love to its adventure bike offerings. It’s creating an alternative to the better-known brands by filling a gap in the market, offering an expensive but highly capable machine, sized just-right for those of us without giraffe-scale limbs. As the phoenix that’s risen from the old BSA ashes, CCM – Clews Competition Motorcycles – began thanks to the desire of its founder, Alan Clews, to ride a lighter-weight off-road machine. 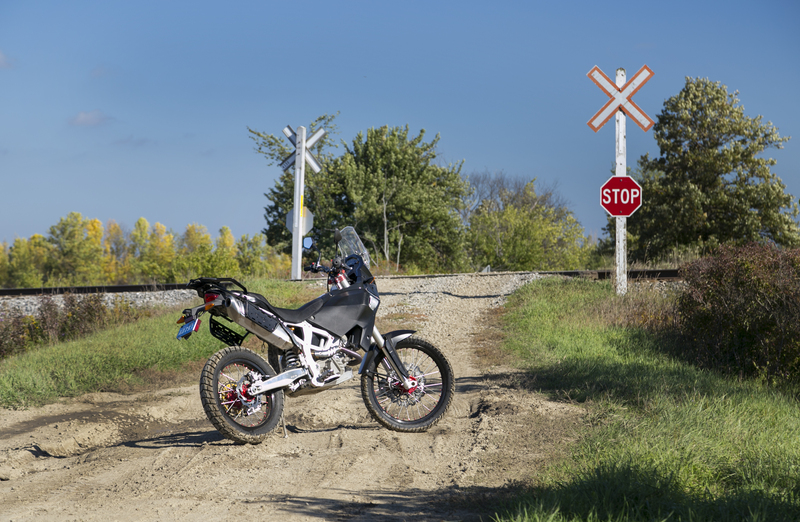 It’s no wonder then that the new, $13,499 GP 450 is the lightest-weight adventure bike available in Canada. 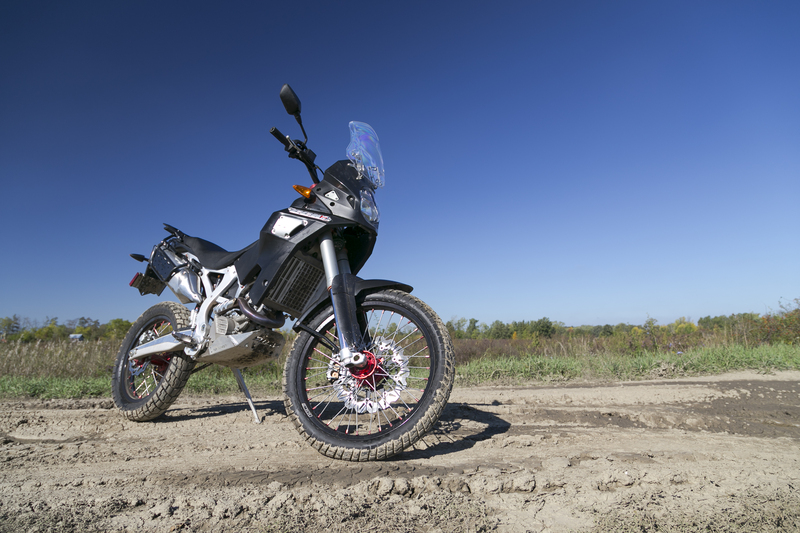 Sometimes, even an adventure bike like the CCM has to wait its turn on dirt roads. All photos by Jeff Wilson. At only 125 kg dry, the GP 450’s lack of bulk is immediately felt upon swinging a leg over the saddle and standing the bike up. That’s at least 50 kg less than the KLR650 or CBR 500X, and is even 3 kg lighter than a Honda CRF250. What’s more, with an 890 mm standard seat height (and the option of lowering it to 790 mm), the CCM is not so intimidating as most towering ADV bikes, This makes the GP 450 a good choice for those getting into adventure riding for the first time, and once seated, the riding position for this 5’9” rider is just about perfect. 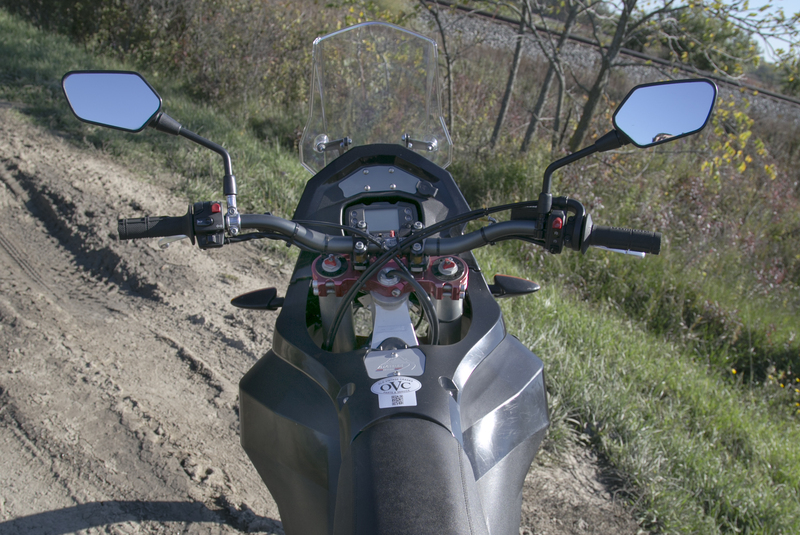 It’s not intimidating, and the windshield keeps the brunt of the wind off the rider’s chest. But it’s the componentry employed by CCM that will attract veterans of the sport – the sort of riders who have permanent grit in their teeth from rarely seeing paved roads. Take the frame, for instance: a unique, forged aluminum unit that ensures strength and lightness, and it looks damned good too. The swingarm is cast aluminum and is supported by a shock that’s adjustable with 12 damping stages and 24 compression stages. Up front are a pair of 47 mm inverse forks, also fully adjustable. The brakes – 320 mm disc up front and 240 mm rear – are clamped by Brembo calipers and provide very impressive stopping power. 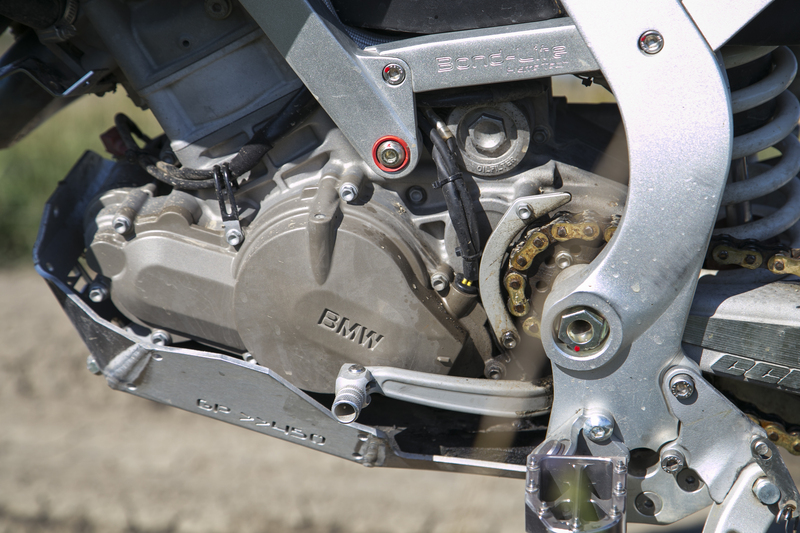 The engine is a 450 cc single that’ll be familiar to BMW fans, who will remember it from defunct enduro models. Now it’s produced in Taiwan by Kymco and sold to the UK firm for assembly in the bike. Output is a modest 40 horsepower (with torque at 32 lb-ft), but propelling such a flyweight machine, even 40 ponies seem plenty. CCM claims the GP 450 will top out at 145 km/h, and while I only saw around 115 km/h or so on the highway, the little engine felt like it had some steam left to keep the speedometer needle climbing. BMW? CCM? Kymco? Make your mind up. There’s a wide assortment of parts sources in the 450 GP. For those needing more oomph, a Performance Pack is available from the dealership that utilizes a Power Commander V, a high performance power plug and a carbon exhaust that provides a reported 30 per cent bump in power to 52 hp. And since these gains come from just adjusted fuelling, timing and freer flowing exhaust without raising the rev limit, both the warranty and service intervals are maintained. It’s not a cheap upgrade though: at $1,750, it makes a pricey bike even more dear. For $800, buyers can add just the Power Commander V to improve fuel efficiency and help smooth out the GP 450’s power delivery throughout the rev range. 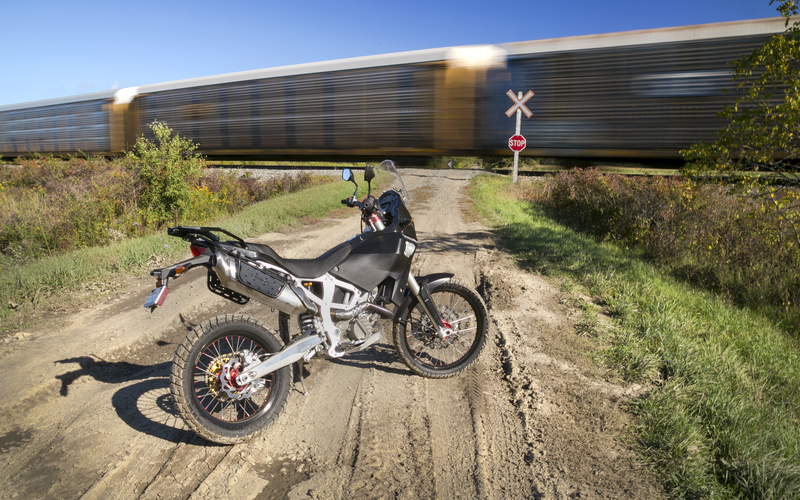 If there’s a downside to the GP 450’s minimalist mass, it’s that a tall-ish, skinny bike on the highway tends to dance around a lot from buffeting and crosswinds, and the front end can feel light and unstable at speed. Plus, like all single-cylinder engines, vibration is a bit of an issue, too. The seat – while comfortable enough for touring – does allow a lot of buzz to the buns; likewise, the footpegs (which look robust enough to support elephants) vibrate plenty too. My test bike was fitted with a rubber damper in the bar mount that quelled the vibrations impressively through the Renthal Fatbar and is worth considering for buyers of the CCM. The GP 450 has a 20 L fuel tank, giving it a proper touring bike range of more than 400 km between fill-ups if you can handle the vibes long enough. So it suits the highway sufficiently, and it’s highly maneuverable around town, but it’s off road that the GP 450 really shines. Down some rutted and mucky paths, the GP 450 was an absolute hoot. The combination of tough-as-nails components with extremely light weight meant that even once I got past my relatively modest off-road riding capability, the bike was easy to manage and recover. 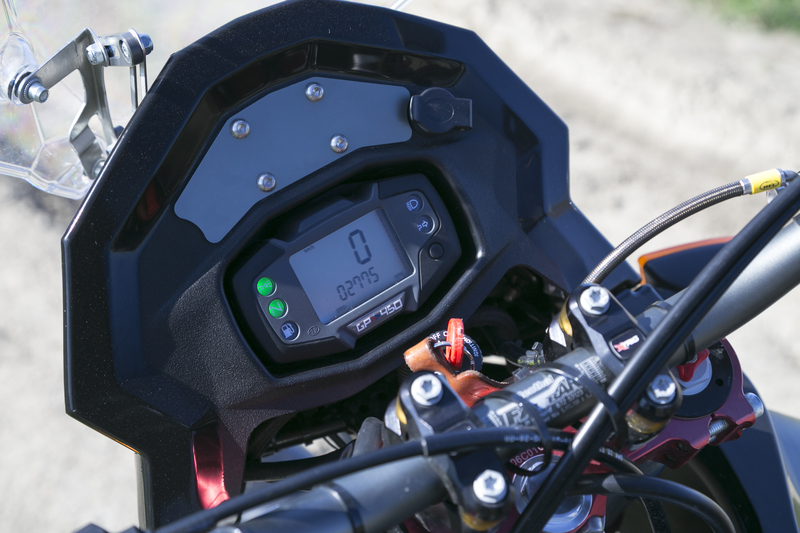 If there’s one complaint about the CCM’s off-road behaviour, it’s toward the hair-trigger throttle that can be a little challenging to modulate during particularly bumpy, slow-speed riding. Oh good – the train’s gone. Time to get going. With CCM being a small production outfit that constructs its bikes from an assemblage of parts, there is plenty of character built in. Some of this character, like the detailing on that forged frame, or even the pleasing sound of the engine, are positive traits. But there are also plenty of details that will make owners smile and nod knowingly to friends, saying “Yeah, it just does that”. For example, the kickstand springs up as soon as the bike is lifted and requires careful positioning when standing the bike up. The standard Tough Bag luggage set for my S model tester isn’t shown in the photos because one of the straps apparently melted on the exhaust, so they weren’t provided for my test. And I was warned to be very careful to not overfill the fuel tank lest it “piss out all over” from the overflow in a serious way. What’s more, the tall gearing – particularly in first – can make the bike very easy to stall (which I did on two occasions in the middle of busy intersections). And the instrument panel consists of a speedo, a trip meter and a handful of idiot lights. North Americans apparently don’t deserve a tachometer. Where’s the tachometer? You don’t need one on the CCM – you can feel the revs buzzing through the grips and the footpegs. Naturally, some of these quirks you’d simply get used to in short order (and in fairness, this particular bike had just been repaired after the last reviewer reportedly crashed it into a tree – hence its missing hand guards and the strange shape to the clutch lever), but there is a sense that this is a hodgepodge assembly, albeit of high-end components, rather than something developed all in the same facility. CCM’s 450 GP is destined to be a rare offering in the motorcycling world, and not just because of a very limited dealer network and the $16,499 cost of admission of my S model tester (a non-S is offered at $13,499 and doesn’t include the luggage set, heavy-duty starter motor or Cush-driven rear wheelset). It doesn’t really look like an expensive motorcycle, but at least it rides like one. 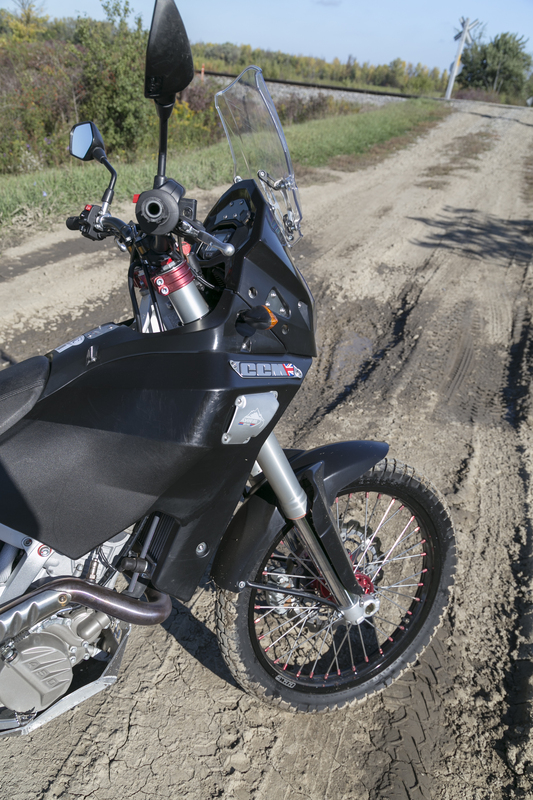 It’s a bike that tries to be as capable off road as some of its high-end competitors like the KTM 450 EXC, but offers touring capability to compete with a Suzuki V-Strom 650 or BMW F700GS. It compromises a bit in each mission, yet marries the two better than other bikes. It’s lighter, lower and easier to manage than any of those bikes too, but costs almost triple the price of a $6,300 Suzuki DR-Z400E. For many buyers, the combination of exclusivity, top-shelf parts and most of all, a manageable size and weight will make the CCM 450 GP an unbeatable value, no matter its cost. That group is likely to remain a small but devout niche, ensuring that spotting CCMs on Canadian roads and trails will remain a rare treat. I’m anxiously awaiting delivery of my CCM ? I’ve been riding it for a week now – 600 km on and off road. Very easy to ride off road and cruises along nicely on the highway. It’s everything I hoped it would be. I would love to buy one of those CCM 450’s in the usa . . . anyone know how? i was under the impression that the power upgrade would void the warranty . This addresses 1 of 2 main issues I have with modern “adventure bikes” – weight. That leaves price, which at $14G makes it too expensive to crash (if it’s ridden as it’s designed you will dump it many times). And back to weight, 125kg is close to a DRZ400 dry, which with a few simple mods makes well over the 40hp that this thing is claiming. I’m sure it’s a hoot though, but while I’d love to see a 6th gear and fuel injection on my DRZ, I cannot rationalize the extra spend for this. Hopefully other manufacturers will take notice… That less is more!